Leek and Potato Soup is flavorful and easy to make, and everyone who tastes it enjoys it. It’s also versatile. You can prepare a simple vegan version, or fancy it up with cream or stock for vegetarian and carnivorous variations. So why has it been so long since you’ve made it? It’s probably that leek thing. Leeks often carry some dirt, so they take a few minutes to clean. Although every supermarket stocks them, they’re usually expensive compared to onions. And onions are almost the same thing, right? Well, no. Similar, but leeks have more depth of flavor, and are a bit less in-your-face than onions. As you’ll discover when you taste this soup. Once you do, you’ll be wondering where leeks have been all your life. 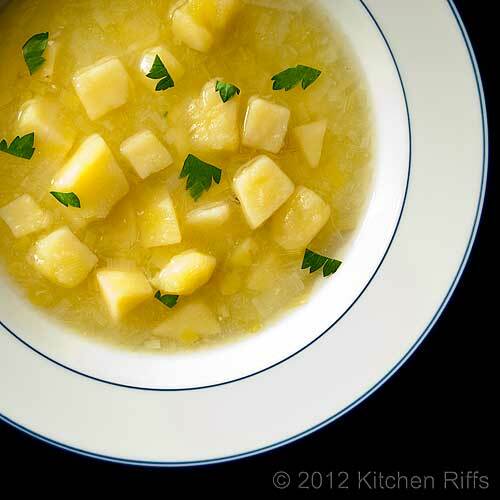 All you really need for this soup are leeks, potatoes, salt and pepper, and water. And maybe an optional garnish of parsley or chives. That’s it. You can gussy it up with stock, milk, cream, sour cream, or butter. If you add cream and chill it, you’ll have vichyssoise, which used to be a favorite at snooty restaurants. I’ll discuss variations in the Notes. At heart, though this is a simple peasant dish. For them, it was dinner, served with some bread. For us? Well, maybe also add a salad and a nice bottle of wine. Although I provide specific ingredient quantities, precise measurements really aren’t necessary. Basically, you want more or less equal quantities of cleaned and cut up leeks and potatoes. Then add about as much liquid (maybe a bit less) as you have leeks and potatoes. Julia Child offers several versions of Leek and Potato Soup in her various cookbooks, but I think her best is in The Way to Cook. My recipe is very slightly adapted from hers, and serves 6 to 8. This dish requires about 10 to 15 minutes prep time, then 30 minutes or so to cook the soup. Leftovers can be stored in the refrigerator for a few days, and they also freeze well. Clean the leeks. Leeks can be a bit dirty, so proper washing is mandatory. To clean them, first remove the first layer if it is wilted. Cut off the tops right at the point where the leek turns from light green to a deeper shade of green. Slice off the tip of the root, being careful to keep leaves attached. Slice the leek in half lengthwise, keeping just a bit of the root end intact so the leaves don’t separate. (If your leeks are particularly fat, cut them again lengthwise — at which point you’ll have cut them into fourths.) Now wash under cold running water, separating each leaf so the stream of water can rinse away any dirt. Once your leeks are clean, cut them into thin slices (about 1/8 inch thick). Scrub the potatoes (peeling them or not as you choose), and either cut them into ½ inch dice, or else cut them in half and cut into slices no more than ¼ inch thick. Add sliced leeks and potatoes to a 4-quart pot, and add 7 to 8 cups of water. Bring to a simmer, and salt to taste. If you want to make the soup ahead of time and serve later, prepare through Step 5. Cool the soup and then refrigerate it in an airtight container until you’re ready to serve. At that time, you can heat the soup in about 5 minutes. A garnish of minced parsley or chives is both attractive and tasty. Although leeks and onions belong to the same botanical family, mature leeks look more like big scallions than onions. They also have a milder flavor than onions, and one that’s a bit more complex. The edible part of the leek is the white base (starting just above the roots) extending up through the light green parts. The dark green parts are technically edible, but they have an extremely tough texture. You might want to use them if you’re making soup stock, however — they’ll add great flavor, and you can discard them when the stock is finished. Leeks vary in size from thin to quite fat, so when you're buying them you have to guesstimate how many you need. BTW, the leek is a national symbol of Wales. I like to keep this soup relatively chunky, so I give it only a few whirls with my stick blender (in Step 5) to puree it just a little. This turns the soup pleasantly cloudy, but you still will have some good-sized pieces of potato. Puree longer with your stick blender if you like a more homogenized texture. If you use a stick blender to puree the soup in Step 5, use one with a metal shaft. Plastics shafts can crack in hot liquid (ask me how I know). If you want a totally smooth soup (which you may for some of the variations we’ll discuss below), it’s easier to cool the soup and then puree in the food processor, blender, or food mill. Pureeing hot soup can be problematic. Steam forms, so in a blender, for example, you can blow the lid off and splash the contents all over your kitchen (again, ask me how I know). I sometimes like to garnish each bowl of soup with a dollop of sour cream. If you want a richer soup than this water-based version, you can substitute chicken, turkey, or vegetable stock. Beef stock would be too strong, IMO. If you want to enrich your soup even more, you can add milk, cream, or sour cream. Right before serving, add about ¾ cup to the soup and simmer for a minute or two to incorporate the flavor. If you’re using milk, use whole milk — skim or 2% just doesn’t add that much flavor. Instead of cream, milk, or sour cream, you can also enrich the soup with butter. 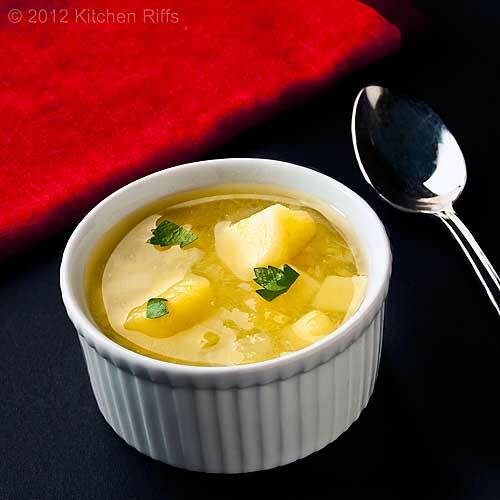 Right before serving, remove the soup from the heat and, by tablespoons, beat in 2 or 3 tablespoons of butter. 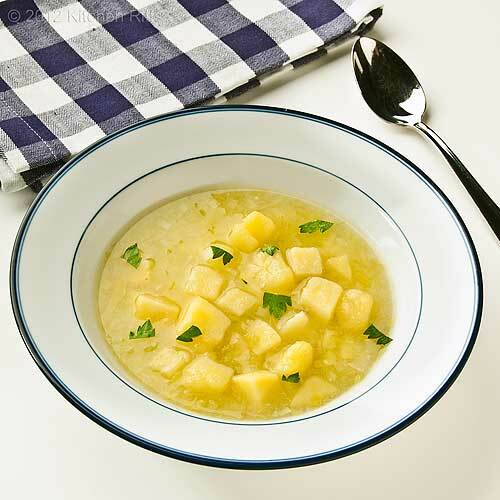 For vichyssoise, make the basic soup using 6 or 7 cups of chicken stock. Add 1 cup of cream when the soup is finished, and beat in. Adjust seasoning (over-season a bit because seasonings lose some of their punch in cold food). Chill the soup. Taste and adjust the seasoning again right before serving. You may also elect to beat in a bit more cream right before serving, to increase the silky richness of the dish. “Who knew vegan could be so good?” asked Mrs KR. “And this recipe is so simple! Sometimes simple is best.” She looked at me, grinning. Actually, we both grinned. Simple are us. Wishing this could be my lunch. And, you're right, it's been way too long since I made a leek and potato soup. Your chunky version looks delicious! I'd take leeks over onions anyday. I love soup for dinner instead of a heavy meal at least once or twice a week. I'm actually on the lookout for some good things to make this week since I'm headed to the store later. Will have to throw some leeks and potatoes in my cart. Simple are us, he he. I don't think you are so simple. Um, I knew vegan could be so good! Lovely recipe and, of course, now going into Chef Tap for future vegan soup creations. Maybe even as soon as tonight because I happen to "always" have leeks, water and potatoes on hand! Hi Lisa, I'm kind of wishing I had some left for lunch, too, but it's all gone! Thanks for your comment. Hi Gina, this time of the year we do soup for dinner at least twice a week - mainly because I make so many soups (we love them!) and they have to be consumed. And you have no idea just how simple I am! ;-) Thanks for the comment. Hi Alex, always happy to put a grin on your face! Thanks for your comment. Hi Kristy, I love leeks too, but always have to think to buy them. This soup is definitely good for you - and despite the potatoes, rather low calorie. Thanks for the comment. Hi Kelly, well of course you knew vegan could be so good! But so many people don't. Cool that you always have leeks on hand - I usually don't. I keep thinking I should grow some, but never have. Maybe next year (I say that every year!). Thanks for your comment. 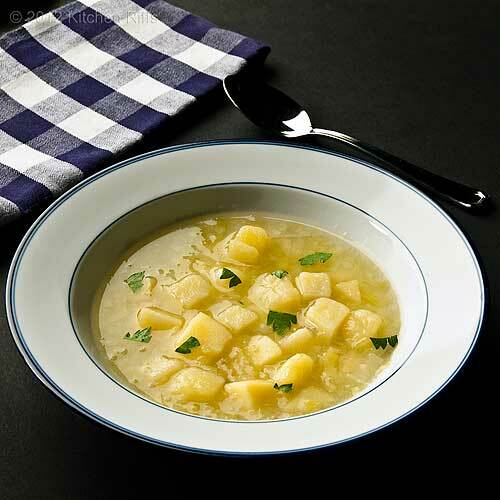 Love this kind of soup, potatoes and leek just seem to be made for each other! Hi Café Sucré Farine, isn't a simple soup like this so good? I agree potatoes and leeks are a wonderful combo. Thanks for your comment. I love leek and potato soup and I too leave it chunky like yours. No stock? Well, now that is something that I would have a hard time eliminating. I guess I'll just have to trust you. :) Great looking soup John! Hi Ray, both the carnivorous and veggie versions are pretty good. And leeks do combine so well with potatoes - really tasty stuff. Thanks for the kind words, and the comment. Hi Uru, it's really a nice soup - so worth having. Thanks for the comment. Hi MJ, it's really worth trying without the stock. At the 1/2 hour mark stick blend it briefly to break up some of the potatoes (leaving most chunky) and taste for seasoning. If it seems to lack flavor, simmer for a bit more time, and try again. If it's still not doing it for you, well, then I guess you can add some cream or stock base. But I think you'll find the water-only version has a bright, fresh flavor that you'll enjoy. Thanks for the comment. Hi Lizzy Do, welcome! Aren't soups so great when the weather turns chilly? One of my favorite fall and winter dishes. Thanks for your comment. This soups sounds delicious. I am a big fan of soup and make one that is similar to this one, but it has onions instead of leeks. To be honest I have never cooked with leeks before, but after reading your description of the leek - I am going to have to try using them. Hi Marina, chunky is good! I do puree this sometimes, but I much prefer the more rustic look. Besides, it's easier! Thanks for your comment. Hi Words of Deliciousness, this soup is good when made with onions, but leeks are magical. Really worth trying sometime - I hope you enjoy it. Thanks for your comment. This look delicious! I've never cooked with leeks before, but this gives me a good reason to try it. A stick blender would be perfect for you. Just put it in the pot, buzz it a few times, and it'll puree a bit of the soup. Easy! Hi Jen, leeks really are nice. I don't use them as much as I should - it's so easy to get into ruts! - but they have wonderful flavor. Thanks for your comment. I luurrrve potato leek soup. Yes it takes a few minutes to get the gravel out but only a few. The rest is easy peasy and SO delicious! This is such a comforting soup. A big bowl of this would be great for dinner. Hi Cathleen, I'm the same way - love the soup, don't make it nearly often enough. Weird, isn't it? Thanks for your comment. Hi Maureen, you're right that it takes only a few minutes to clean the leeks. And the process is easy, just a tad fiddly. After that, cutting up the leeks is dead easy. Thanks for your comment. Hi Asmita, it really is comforting. Super flavor - for a main course, I'd want two bowls! It's that good. Thanks for the comment. This is a great soup, perfect for this time of year. I like, too, that you didn't purée it till smooth. I prefer a little texture occasionally. And thanks for the tips for suing this for vichyssoise. I made a version umpteen years ago for a couple friends when I moved into my first apartment. It's remained a favorite ever since. Thanks for the recipe and the memories. Hi Chicago John, it's a great soup. I haven't made the vichyssoise version in years, but in hot weather it's very tasty, though just a bit on the heavy side (serve it with a salad and you're fine). Thanks for the comment. This soup looks incredible, and I'll be trying it soon. I love leek and potato soup, so why don't I ever make it for myself? Sometimes it's easy to overlook simple recipes. Hi Beth, I know all about not making this great soup! So weird - I think part of it is there are so many new things to try that we get distracted! Thanks for your comment. With a big hunk of crusty bread, I'd be totally set with a bowl of this hearty soup. Mmm, perfect for the cooler nights ahead. Potato leek soup is a favorite in our house! Especially in the winter, I make a big pot of soup on the weekends and as we eat it for lunch every day the flavor gets better and better. I'm sure this soup would make great leftovers. I'm looking forward to giving this version a try! Definitely gonna try this one when I use up the potato and onion soup I made a day or two ago (I didn't have any leeks and wanted potato soup). For the record; potato and onion soup is pretty awesome too, but you're right that leeks have a wonderful flavour profile in potato soup. Hi Carolyn, this is perfect for those cooler nights! And where you live, I'll bet the bread would be a nice sourdough. Thanks for your comment. Hi Jeanne, you're right about the flavor of soup improving with age, and this one is no exception. Even when you freeze it, the flavor seems to improve. Thanks for your comment. Hi Food Junkie, I agree that potato and onion soup is a nice combo, and one I sometimes make (I prefer stock to water when I make that). Leeks just add another flavor dimension that's so nice. Thanks for your comment. Hi Hotly Spiced, blending the soup is nice, too, as is leaving it chunky. It looks more like soup when you blend it. Leave it chunky? More interesting texture, which I think looks nicer on the spoon. I keep threatening to grow leeks - I should really give it a try sometime. Thanks for your comment. I always forget about making Potato Leek soup. It's so yummy and you make it look so simple. Great facts and tips about leeks. Hmm I don't think I saw the recipe yet for your Sweet Potato soup. I need to go check that out. Glad you have that list below. What would I give if I could just stand in your kitchen and watch these exchanges? No wonder your food comes with such a passion. You and the missus are such gems--never stop these fabulous, genuine conversations! Hi Vicki, for some reason it's an easy soup to overlook - I do it too. Thanks for the comment. Hi wallflourgirl, ;-) I don't include interchanges between Mrs K R and me in every post, but I do in many - they're fun to write. And I'm glad you find them fun to read! Thanks for that, and for your comment. So comforting and scrumptious! I really love the refined flavor and sweetness of leeks. Leek and potato soup is such a classic soup! I love it...actually wish for some now, as our weather has turned somewhat wintery! We're so on the same page - I just made potato and leek soup a few days ago! Yours looks amazing, I'll have to try it this way next time. Hi Rosa, aren't leeks nice? Great flavor. Nice in soup, or in a gratin. Thanks for your comment. Hi Ali, if your weather is wintry, you should probably make yourself some! ;-) Thanks for your comment. Hi Katherine, great minds and all of that. ;-) One of the great things about this soup is there are so many different variations of it - you never have to make it exactly the same way twice. Thanks for your comment. Hi everydaymaven, a leek base with butternut squash and white beans sounds mighty good to me! Really nice combo - I'll bet it will be excellent. Thanks for the comment. I love potato leek soup. I usually puree all together to make creamy texture. I think chunky potato pieces in the soup can add a nice bite to enjoy. Yes, your wife is right. Simple food is the best. I like that cocktail is changing to soup, John! :) I have potato leek soup recipe that I've been using but going to switch to yours for a change! Have a nice weekend! Hi Holly, creamy can be quite nice, but I guess I'm a chunky guy at heart. I even like lumpy mashed potatoes! And Mrs K R is usually right. ;-) Thanks for your comment. Hi Nami, cocktails, soup — they're both liquids, right? ;-) I change up my recipes all the time. Although I may make the same dish, it's rare that I make it exactly the same way twice (there are some obvious exceptions, like baking, or how to roast meat, etc.). Thanks for your comment. I have a friend who swears by leek and potato soup but I have never tried it. Hi Terra, simple is good. ;-) Leeks get so dirty because when you grow them you heap soil up around them. Cleaning is just a bit of a chore, but such flavor! And as you say, in soup they're amazing. Thanks for the comment. Hi Sawsan, it's definitely worth trying. As you noted, it has a clean, simple flavor - really excellent. I think you'll enjoy it. Thanks for commenting. Hi Mother Rimmy, the flavor of leeks - although mild, as you note - is just so awesome. Sorry about your cold. I'd make this with chicken stock in your case - medicinal value in the chicken stock, you know. ;-) Thanks for the comment. I adore leeks. I've been using them in place of onions for some time now when I want a more delicate flavour with great depth. Great post. Hi Amanda, leeks are really underused in the US. Or at least I don't use them enough, and judging from how few are stocked in my grocery store, I'm not the only one! Thanks for your comment. Hi Raymund, it's about as simple a soup as you can get! I hope you enjoy it. Thanks for your comment. This soup is so suprising. I used only water and garnished with fresh parsley. It's light and comforting. I immediately felt like I was 7 years old again, sick and waiting for mom to bring me some feel-better soup. And that's what my family calls it now: "feel-better soup." Hi Ro'Chele, isn't it good using just water? Surprisingly flavorful. I like what you call it - "feel-better soup!" Thanks for your comment.